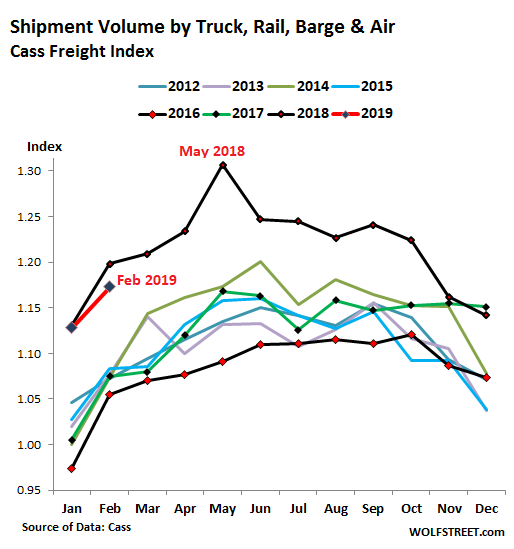 So with shipment volume declining, the pressures the sector experienced last year are fading, and inflation in transportation services is backing off from the extraordinary rates in 2018 but remains substantial. 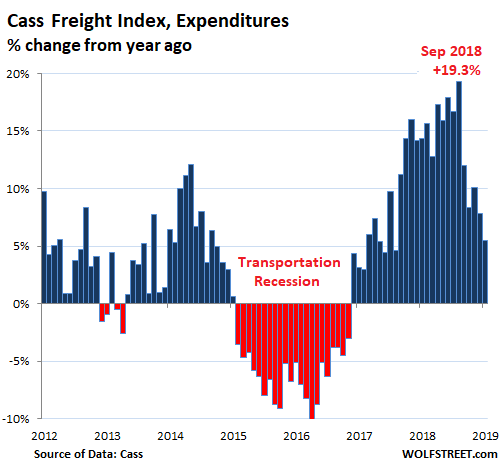 For transportation spending by shippers to actually decline, as it did during the transportation recession, lower volume of shipments and excess capacity by truckers and railroads would have to be able to push transportation providers to cut their rates. This happened during the transportation recession on a fairly broad scale. So volume growth is slightly lower than growth in 2018, which was record year. MAGA. No, look at it again. This volume “growth” is negative. It’s an actual decline in volume. Meaning less than a year ago. Forget growth. 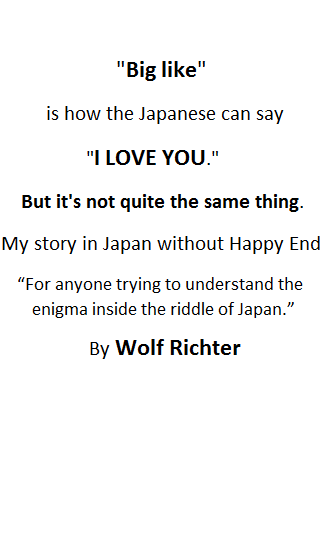 Thanks Wolf, thats not too positive. To add, we have majority of baby boomers not even remotely prepared for retirement, 3/4 of the country broke, and Sillicon Valley that holds like a third of sp500 ‘value’ only few legal terms away from outright fraud. But the growth is remarkable. With a large majority still carrying debt and with little set aside for retirement, watch for this societal demographic to remain in the workforce, until forced to retire because of ill health. This segment of the population now have a negative impact on the economy. As more and more place demands on the health care/pension systems, to say nothing of cheap affordable housing or extended care living. The situation is due to become worse, before this population bubble passes. As the length of life expectancy is projected to only get longer. Math does not lie. The numbers are what they are. I think Andy is comparing numbers to 2017. One of the things your article doesn’t suggest is that the reason for the record year is the Bon-Ton and Toys R Us liquidations. Amazon wins again and the rest of the country loses. Mr. Richter, do you have Cass data going back to 2007? If so would you post it? I have the data going back to 1999. If I have a specific issue that I want to compare to the Financial Crisis, I might included it. Otherwise I won’t. The bottom fell out during the Financial Crisis. I’m not that young, but this was the first time in my life this happened. And it may well remain the only time. The Cass Freight Index for Shipments plunged 55% from Jan 2006 to Jan 2009. Things just stopped. And afterwards, the recovery was similarly huge. Putting these crazy numbers on a chart of normal economic times distorts everything. The Financial Crisis was nearly a decade ago. There is no reason to keep putting it into everything unless you want to address a specific issue about it. However, I linked the Cass Freight Index, and you’re free to check out the data yourself. Wonder if the artifical surge by retailers to beat the China tariffs might have something to do with a potential temporary shipping volume drop? That is the first thing I thought also. Baltic Dry is down 50% from a year ago, but has had a little bump up lately. I know there’s cyclicality, but 50% swings, that sounds sick! BDI is higher today than it was in 2016. And 2017/8 were economic boom years. Look at a 5 year chart and it’s a roller coaster chart with wild short term swings. In other words BDI means jack as a predictor of the economy. Like all and any statistics, BDI is not a predictor of the economy but a record of what has occurred. Extrapolating trends is the predictor, whether by human interpretation bias or computer model, and their projections tend to be linear – until they aren’t. Everything goes up until it goes down and vice versa. … except the tinfoil hat guys who are right every once in a while. But then, who could imagine a head-of-the-Fed or a president saying the bottom was going to drop out? It’s definitely not part of the job description. One thing you can be assured of: printing money solves everything, until once in a hundred years it doesn’t. 2009: one of the greatest (asset) booms in history when everyone was in gloom and doom end-of-the-world mode. I was actually thinking the opposite. Many importers were scrambling to beat the potential 15% increase in tariffs (25% total) which was expected to go into effect on March 1st (until Trump got scared and backed off of his empty threat in order to protect the stock market). Most importers thought the increase to 25% was a for sure thing and scrambled to build inventories prior to the cutoff, leading to more activity in freight during the proceeding months. I work at a major trucking freight company in ny, that has locations nationally. I was told a few days ago by a manager who has been there over 25 years that this past February and now March is the slowest ones they could recall. This past weekend was the slowest I’ve seen in my 14 months there. I’ve never heard the term transportation recession before. Transportation Recession is fairly common. My wife and I worked at an Express freight company for about a decade. When a recession hit, we felt it in our income. I am retired now, but we still own that company’s stock so we still feel recessions. I wasn’t doubting that it existed, just saying I personally had never heard of it. The big question is whether it is still worth it to stimulate the economy? After a decade of extremely low interest rates, and a recent tax cut, a recovering job market, low inflation; what else do we need? Why not three decades of extremely low interest rates. >what else do we need? That was the Keynesian idea and even before Keynes; inflate in recession and deflate during expansion. The problem is they always forget to do the second part. They used to call it open market operations but just give it a new name every once in a while. The thought occurs to me that even before fiat “flexible accounting” that during hard times a society would turn to (or if not on!) its authority, which would subsequently inflate in relevance and management (whether installing discipline of one kind or another on its own people, or simply choosing to organise a plunder of neighbours) . Of course to the victors belong the spoils (and even were the effort by authority effectively useless beyond providing some kind of reference) and so any subsequent extravagance would be a deflationary celebration and a return to a more neutral order. However modern monetary policy has changed that somehow. In times of stress the population turns to authority, and what does it do? It takes control of the economy monetarily, increasing its portion of distribution and activity. Unfortunately there is no combat and no victory in that because the population are automated in their response, success is immediate as witnessed by the arrival of more money in people’s hands, and so the extravagant deflationary celebration is occuring as the plunder of the wealth of the nation is actually taking place, being touted as a victory that must be continued. There is no extravagant celebration of success awaiting once the hard work of consuming has been achieved though, the long deflation occuring simultaneously to the previous act will just be ever more evident, and of course be used as reason for ever greater arrogance. I remember Ross Perot scaring the crap out of me in 1992 with his charts and doomdsay prediction of what the debt would do. Granted I was young and stupid and easily impressionable, but still it made sense. And I remember hearing forever how SS was going to run out of money by Date X. And Date X comes and goes and somehow SS still has money and the new run out of money date is 10 years into the future. And here we are almost 30 years post Perot and the same doomsday predictions are out there about the debt. Kinda like how global warming was going to kill us all in 1990 then 2000 then 2010 then 2020. The catastrophe is always just around the corner yet we never reach it. I think the newest doomdsay date is 12 years from now when the world will blow up if we don’t ban cow farts. We really do control our own destiny if we don’t fall victim to the victim mentality of ‘They’ controlling everything. as Bernie, Lizzy and AOC are shoutung from the rooftops, “deficits in general do not matter” – they get bigger and bigger but who cares. The problem is the limit of resources, in this case manufacturing capacity of trucks. In fact, in a better controlled economy these huge boom-bust cycles would not happen. Bring on the GND – Go Bernie!!!! True. In a Bernie run economy there would be no booms or busts. There would be no economic activity period. We’d get rid of income inequality once and for all. Everyone would be dirt poor and equally miserable. Most of this is caused by the auto companies and the China trade war. Once Trump puts the China trade war to bed the economy will start exploding again. The auto companies need to change the way they buy their material. Too much money is spent outside of the US. The UAW must lower its salary demands. Bottom line, look for the economy to start exploding again mid-year. The China trade situation isn’t going to bed. The number of issues that are being created, and will continue to be created, exceeds the rate at which they can be solved. Toss in the occasional change of government on either side (and associated priorities) and more issues will pop up. The trade relationship between the world’s two largest economies is inherently going to be conflicted although hopefully it stays peaceful. Plus China’s economy is on the downswing and we rely too much on that economy. So in June and July can we expect you to come back with an “I told you so” or an “I was out of my mind”? So why is this happening? Isn’t cosumption expected to keep up? We’ll see when this inventory is sold if the downtrend continues. It’s not…normal, answer to Iamafan. Regarding the ‘services sector better hang in there’ Wolf mentioned a couple Sunday nights ago that services are expected to exceed manufacturing in a modern economy. While ‘goods’ and ‘manufacturing’ are obviously not interchangeable, is there a relationship that is generally considered healthy/sustainable relative to services? If so, anyone know where we’re at and how it is trending? Long time reader first time poster. General question, why do you believe the stats that the government provides? I’ve been reading economic and finance websites since 2008 and most people generally agree that the chinese goverment fudges the numbers, but why do we trust the US government? After all these years of lies how many times does lucy pull away the football before we learn they can’t be trusted? US GDP grew by 5 trillion from 2007 to 2017 but US federal debt grew by about 10 trillion. Energy consumption is about equal to where it was or slightly below the 2007-08 peak. According to John williams at shadow stats US industrial production never regained the peak from the prior boom. As Mark Twain said you’ve got lies, damn lies, and statistics. BTW, the Cass Freight Index data cited here is not government data at all. It’s the data from a company that processes $20 billion a year in freight billings. Fair enough, but look at the recent example of Boeing. A private company that was allowed to certify its own aircraft. After 2008 and the responses from both private industry and the government i trust neither. Thank you for your response. Then make up your own numbers, stats and graphs. But don’t be surprised if they are not believed…. 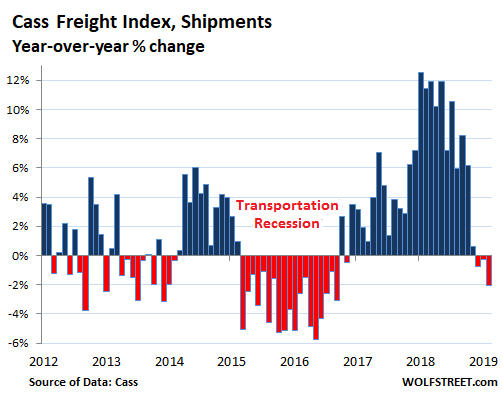 If the shippers are paying more now to move their product why isn’t this trickling down to the carriers because Freight is still way down below $2 a mile and heavy. Parallel, but slightly off topic. Lumber and growth forecasts. I live in logging country on Vancouver Island. I expected to see a slowdown this winter with a drop in US new construction. In fact, the opposite has occured and prices are sky high. I was talking with a neighbour who lost a lot of trees to windfall, the result of a vicious winter storm in December. Well, they are coming in to take out about 4 logging trucks worth, all of it pre-sold at a very high price. Red cedar is going for $200 US/cubic metre. Cottonwood, (a species we won’t even use for firewood or campfires), is over $80 US. I was out on a friend’s boat yesterday and we launch in the booming grounds. They are pumping the wood out, and because it is winter and the logging is lower elevation, the wood is 2nd or 3rd growth, what we call pecker poles. All is pre-sold. It would make nice firewood, but we still do better with the old growth scrap from the dryland sort. Housing and construction across the World, and the US, is going gang busters. With recent flooding, last years fires, and this year’s looming fires and hurricanes associated with climate change, I don’t see this changing barring a total economic collapase, as long as interest rates remain low. “Unexpected hot demand for lumber in the U.S. kept prices high for most of this year. Severe supply-chain issues only exacerbated this situation. Sawmills and lumber suppliers took full advantage of this by raising prices as much as they could. The duty rate into the U.S. was simply added on to seller list prices. Customers were not in a position to negotiate this back down. I think in previous housing booms subdivisions and condos were much quicker to permit, grade and build to completion. Now it seems as though they drag on for several years from start to completion. Much of the construction I see was planned and started a year or two ago and is halfway towards completion with lots of building materials yet to be used. It is not bad enough for the builders to mothball things and walk away ( except for the insolvent) so things will crawl along in a slow motion unwind, until the banks get so worried that they pull the plug on ongoing construction, then things will get interesting. I do not buy frequently from Amazon. I usually wait until I can submit a large enough order to get free shipping. But last week I was able to submit an $11 order with free shipping. I guess shippers are paying really really big.